This week I took a lovely stroll down memory lane through one of my first favourite books. It got me to thinking about the books I love, and why. When I say ‘favourite’, I’m not just talking fond memories of picture books, or The Babysitters Club type books that I just ‘HAD’ to collect each time a new volume was published. I mean falling in love with a story and the characters within, characters who got under my skin and lingered long after I closed the cover for the last time. One of those first impacting books for me was Goodnight Mr Tom, which I read when I was at Intermediate School (the old-school term for Year 7, or about age 11). I’ve turned the pages of many many MANY books since then. Some characters slipped out of my mind as soon as the story ended, others entered my heart forevermore. Laura and Mary from Little House on the Prairie, Anne Shirley of Avonlea, Heidi, Jo and her sisters in Little Women, Katy and what she did, to name a few who stayed with me. I sure had the company and example of strong independant girls through my pre-teen years didn’t I?! How grateful I am to my mum for ensuring my love of reading was fed with amazing writing, stories and characters – many of the books I still have and read to my daughter at bedtime each night. She too devours books, though I do struggle to keep her away from the books full of magic and fairies. All in good time I guess and in the meantime, we’re working through my old favourites in our shared reading time. Anyway, I have also often thought of Willie and Mr Tom over the years. 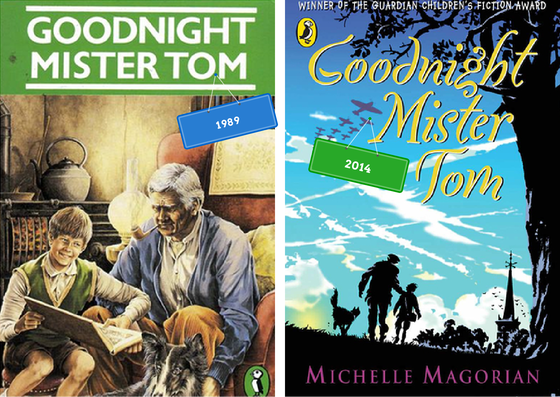 When I saw a copy of Goodnight Mr Tom in the library over the weekend, albeit a slightly different version, I was compelled to check it out and see if my memories were justified. Meeting Willie, Mr Tom and Sam the dog on the first page of Chapter One was like being reacquainted with old friends. I spent a blissful couple of nights being reminded of their adventures, good and bad. Having since lived in the English countryside where much of the novel is set, the movie reel in my mind was so much more vivid. So while the book covers change, my love of a good story and getting to know genuine (strong!) characters most definitely has not. Oh how I adore books. I so agree about characters that stay with you. My boys often go for fairies etc too but I remind myself my mum really didn’t ‘censor’ our reading either and we’ve all stopped reading baby sitters club and sweet valley high of our own accord and gone on to much more interesting (and valuable!) reading. Thanks for your lovely comments.